Home » Rustic Fence Blog » What can Damage my Fencing? When you get a new fence, it can be quite a joy to admire. But this appreciation may dwindle if your fence starts to show signs of wear and tear. If your fence is very old, this wear and tear may be inevitable; but if it is fairly new, then your fence breaking down early can be frustrating. If you have a fence that looks nice and you want to maintain it, it’s important to know what problems to protect it against. Here are the most common things that damage fencing and what you can do to prevent this damage. Your fence is strong, but it still has its limits. Wooden fences can only hold so much weight before they begin to bend or crack. Even iron fences – with their long, thin posts – can bend if you hang too much weight on them. And then of course there are chain link fences, which can easily get bent out of shape. It’s important that you never just assume that your fence can handle the weight of whatever you hang on it. The company that built your fence may be able to give you a good idea of how much weight your fence can support. If you don’t know who built the fence, just avoid hanging anything very heavy on it. As long as you don’t hang anything like large tools or heavy Christmas decorations from your fence, it will be able to maintain its integrity. One of the greatest enemies to any fence is moisture. Over time, the water that wood fences absorb will turn into rot and mold which eat away at the fence. Metal fences that are exposed to water will eventually corrode and rust, which can eventually bring down even the strongest iron. It’s important to apply varnish or paint that will protect your fence from the effects of water. If you can contact the fence installer, they will be able to tell you what kinds of varnish and paint you can use. If not, then finding a water resistant paint for your iron fence shouldn’t be too hard, but wood fences may be more complicated. Wood fences can be constructed out a wide variety of materials, and each may be compatible with different kinds of paints or varnishes. Do your best to determine what kind of wood was used to construct your fence before buying a water-resistant paint or varnish for it. Arbors and trellises look great with vines growing on them; wood fences do not. Woody vines may hold water against your fence, causing the same wood rot that you’re trying to prevent with that varnish. Wooden fences can also get broken apart by woody vines that grow between their slats – especially if the fence is already compromised due to excess moisture. Invasive species tend to grow quickly and get out of control fast. Even if they’re planted far from your fence, they’re likely to make their way over to it. They can quickly wrap around your wooden fence and destroy its integrity. Try to place plants far from fencing and watch how nearby plants affect your fence. Be especially watchful if you have one of the above kinds of plants in your yard. Termites. Dry wood termites eat any dry wood that they can find. Subterranean termites build their nests at the base of fence posts. 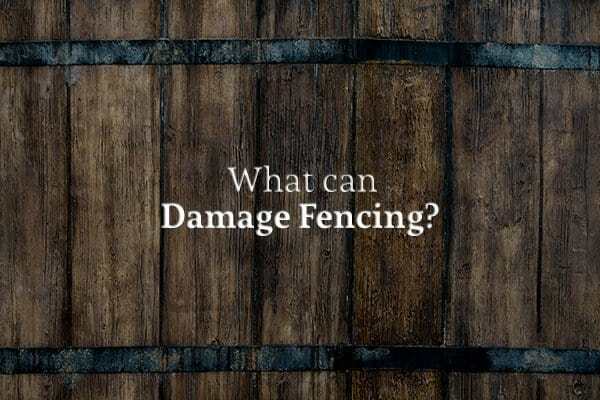 Both can cause significant damage to your fencing. Carpenter Ants. These ants don’t eat wood – they build nests in it. However, they’ll generally only build their nests in areas where the wood is rotting. Powder Post Beetles. Powder post beetles lay their eggs in holes that they bore in wood. The larvae will feed off the wood around them once they hatch. The best way to prevent damage from these insects is to use insecticides on your fence. Of course, if a storm is bad enough, it could take out sections of your fencing. This is generally an unavoidable problem. However, to prevent the damage from getting worse, you should get the damaged sections repaired as soon as possible. If you want to make sure that your fence stands the test of time, get your fence installed by Rustic Fence. With over 50 years of experience and full warranties on all fence builds, they’ll make sure that you get a quality fence and that you know how to maintain it for years to come.